Easter is one of my favourite times of the year in terms of food. I have a not so secret guilty pleasure I love Cadbury’s Mini Eggs! 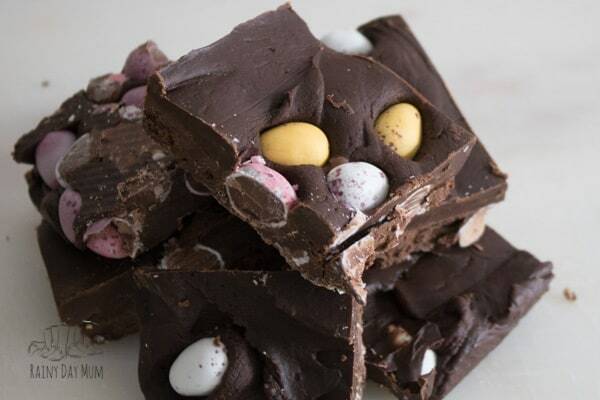 Apart from eating them from the bag in secret when my kids are around so I don’t have to share them, I love using them in recipes you can find the Cadbury Mini Egg Cheesecake that I love to make this time of year in amongst our Favourite Easter Family Recipes, today I’m sharing a variation of my Slow Cooker Fudge that I make as an Easter Treat to gift at this time of the year. 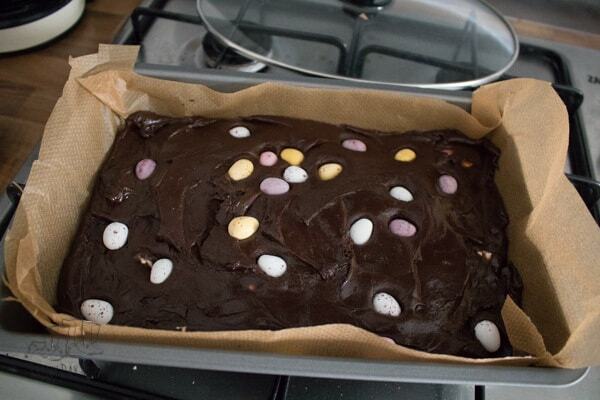 So here it is my Easter Slow Cooker Fudge made with Cadbury Mini Eggs. 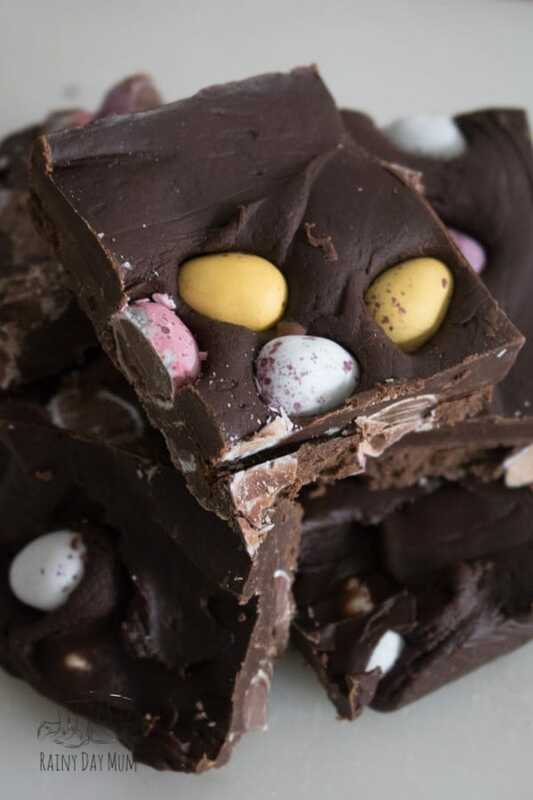 We love homemade fudge and have put all of our easy fudge recipes together for you to find ones to make throughout the year. From slow cooker fudge to those made in a double boiler. These simple recipes are ideal for you and kids to make. 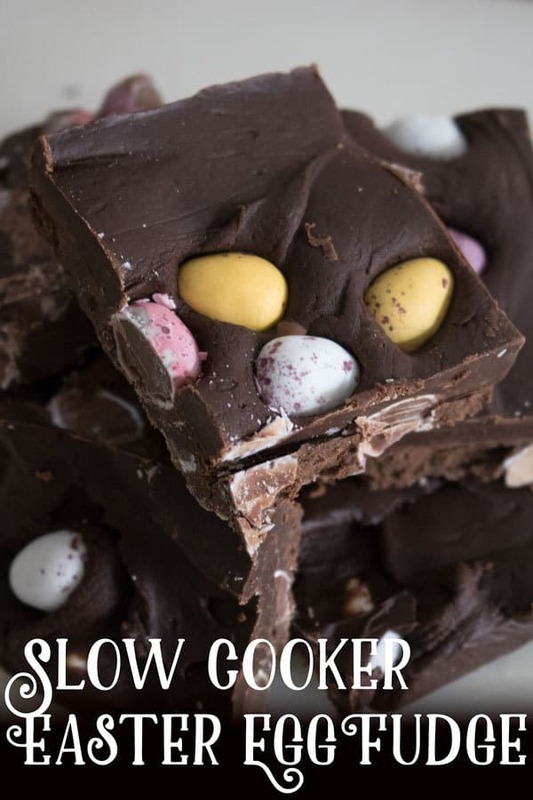 I love how easy this recipe is to make – I’ve made it with the kids as using the slow cooker means that unlike with a traditional fudge recipe where you have to be very careful with the temperature the slow cooker controls the temperature and makes it easier to make. This batch I mixed up with dark chocolate – I happen to know that one of our relations doesn’t like milk chocolate and only dark so instead of splitting the chocolate that I used between two different sorts this time I just used the dark chocolate chips in the mix and the result was a delicious more bitter fudge than the one that we would normally make at Christmas. 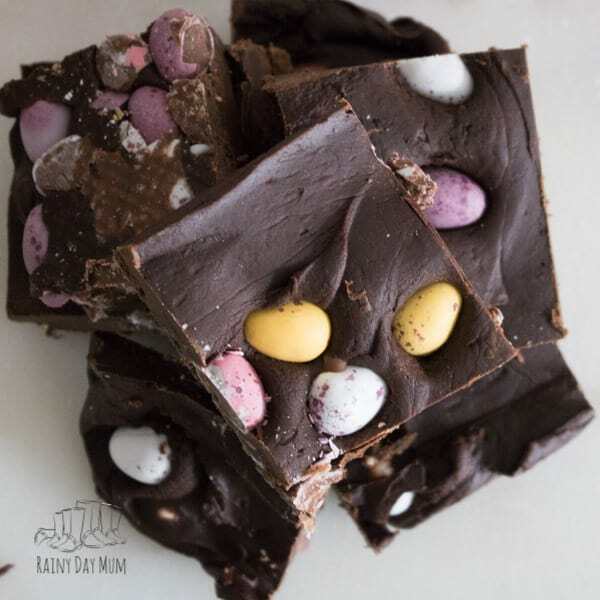 Love this variation of fudge then check out our video for Chocolate Orange Fudge which can also be made in the slow cooker! We have included affiliate links to the ingredients and products we used – if you purchase via these links we may earn a small commission. Scroll past the equipment we recommend to get a printable recipe card with the ingredients and step-by-step instructions on. We have a large slow cooker, although only having 4 in the family it makes much more sense as we can batch cook and put it in the freezer. When making the fudge it means that I can easily double or triple the recipe especially useful when making the fudge as gifts instead of as a family treat. 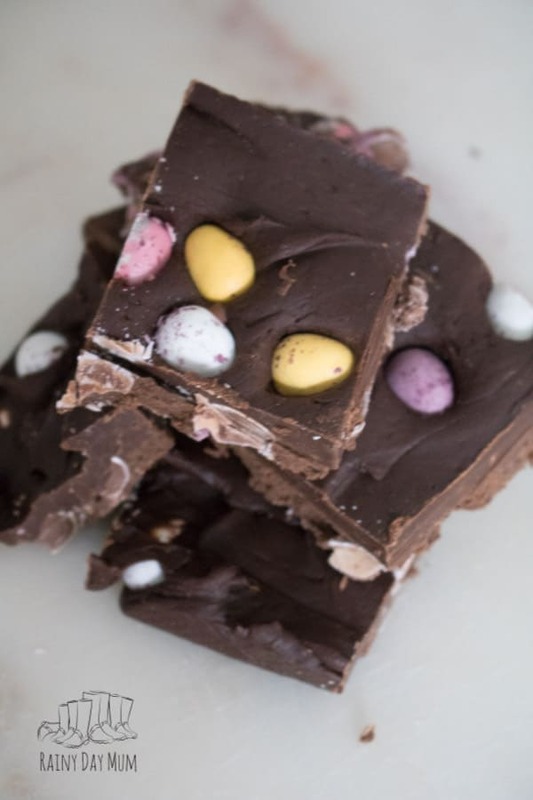 I have used square baking tins to set my fudge in in the past but recently started to use a rectangle tin with some silicone coated parchment paper which is kinder to the environment than normal greaseproof paper. Layer the bottom of these cute Easter Gift boxes with some of the parchment paper and then add in some of your homemade gift and you have perfect Easter Gift Boxes to hand out to friends and family filled with homemade Easter Fudge. 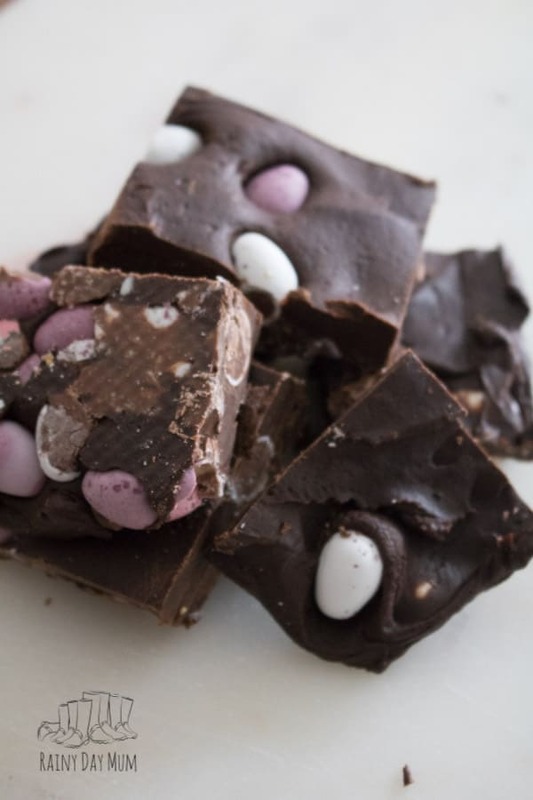 And just because I don’t always want to share – I have an Easter Plate that I fill with the fudge and have it out over Easter weekend to enjoy little bites of as and when. 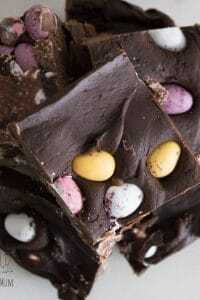 Easy to make Easter fudge recipe with Cadbury Mini Eggs, perfect for some Easter gift or to treat yourself - find out how to make this either with dark chocolate or milk chocolate it's so easy even the kids can do it themselves. Pour the condensed milk and vanilla extract into the slow cooker. Add in the chocolate chips and Unsalted butter. Put the slow cooker on low and stir. Set a timer for 10 minutes and stir when it goes off. Repeat the setting of the timer and stirring for 2 hours until the fudge is smooth and melted together nicely. 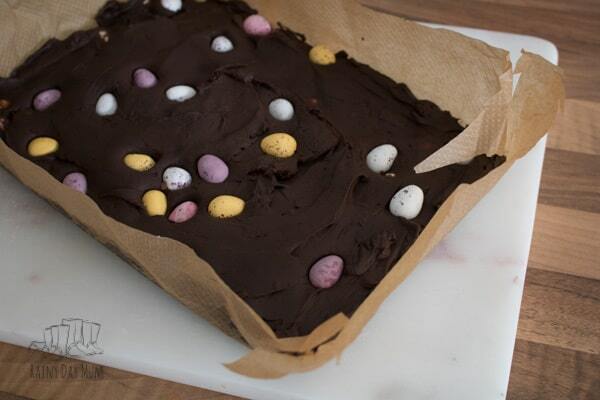 Place half the mini eggs into a bag and crush with a rolling pin. 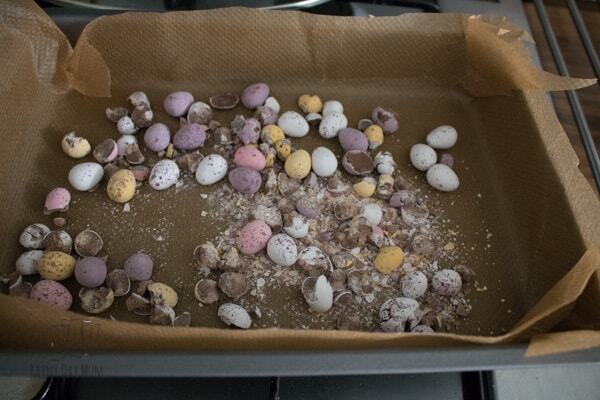 Line a baking tin and sprinkle the crushed mini-eggs over the bottom. Add in a few whole mini-eggs. 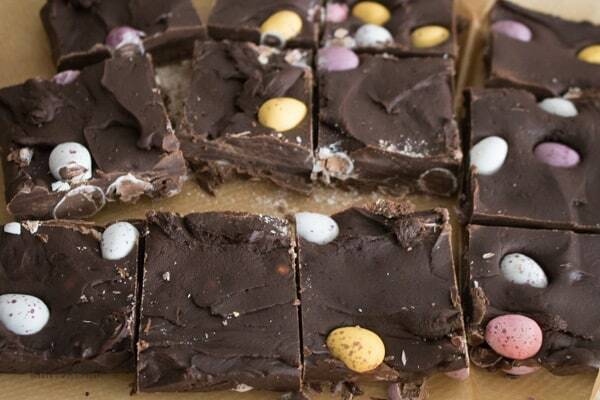 Pour in the fudge and mix in the crushed and whole mini-eggs whilst in the baking pan. 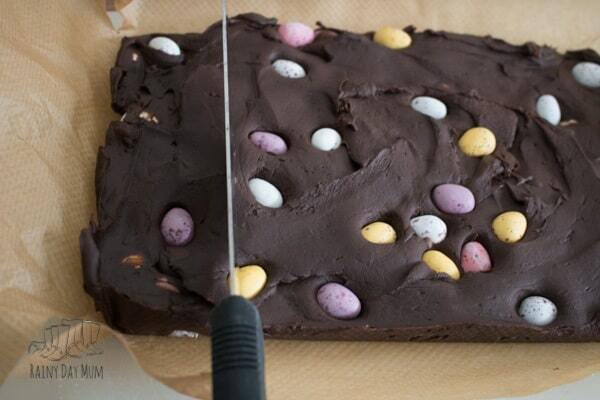 Sprinkle the top with the remaining whole mini-eggs and then push in. Place in the fridge and set for a few hours. Cut the fudge into cubes. You had me at fudge! It is so easy to make and the little eggs just add a little something festive to it! This stuff is so good it just doesn’t last long with my house full of sweet fanatics! I allow myself ONE small bag of cadbury mini eggs each year because once I start eating them I can’t stop myself. We love fudge and the fact that this is made in the slow cooker makes me ready to hop over to the grocery store to pick up the supplies. My kids are going to absolutely love this surprise! Especially since we don’t celebrate Easter, it will be a way for them to feel a little bit included in their friends’ festivities. I’m giving this a go! I had to think for a second whether or not the instructions meant hen’s eggs should be added as well as the wording is *slightly* ambiguous – but no. 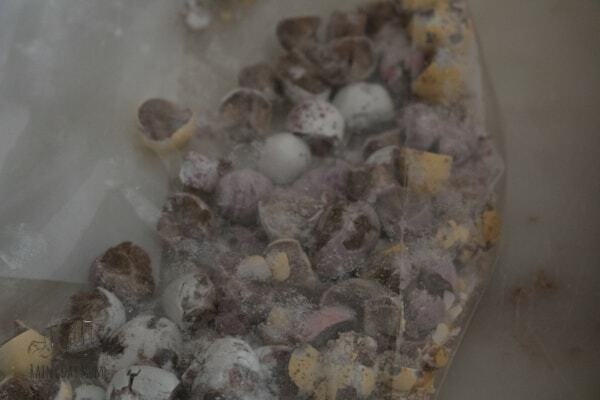 Just mini eggs. Phew. !